The Swiss Election Study (Selects) has been investigating the electoral behaviour of Swiss citizens in national elections since 1995. The project sheds light on the dynamics of the citizens’ opinion formation as well as on the determinants of their political participation and voting choice for a specific candidate or party. In addition, a survey of the candidates collects data on their campaign activities, policy positions and views on representation. Since its launch in 1995, Selects has generated a series of datasets enabling long-term comparisons while constantly incorporating innovative new research questions. Selects is funded by the Swiss National Science Foundation (SNSF) and has been centred at FORS since 2008. Swiss national parliamentary elections are frequently considered to be “low salience” elections. 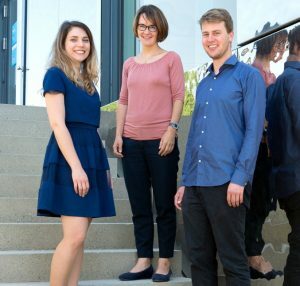 Thus, for a long time, interest in national elections was rather limited – not only on the part of the Swiss electorate (turnout between 1971 and 2015 has mostly remained under 50%), but also on the part of academic electoral research: No election survey was conducted until the early 1970s. It was probably the growing polarisation of Swiss politics and the rise of the populist right in the early 1990s that resulted in a new surge of interest in federal elections. 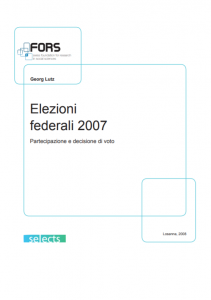 With the formation of the Swiss Election Study (Selects) project, initially an association of the political science departments of the universities of Bern, Geneva and Zurich, the 1995 election constituted, in Peter Farago’s (1995) words, a “new start” in this respect, Since then, large-scale surveys have been carried out within the framework of the Selects project for the federal elections of 1995, 1999, 2003, 2007, 2011 and 2015, ultimately resulting in not only a consolidation but also in a massive expansion of electoral research in Switzerland. At the level of voters, Selects enables researchers to study participation, political opinions and voting intention/choice of Swiss citizens based on large-scale post-election surveys and panel surveys. On the candidates’ side, Selects conducts candidate surveys, studying issues such as factors of electoral success or the links between voters and elites. Finally, within the framework of media analyses, vast amounts of data on the election campaign in the mass media are collected in order to put individual opinion formation processes into their information context. In addition to these data, Selects also created a cumulative dataset, spanning from 1971 to 2015, which enables long-term comparisons between Swiss elections. The Comparative Study of Electoral Systems (CSES) is an international network of national election studies. CSES develops questionnaire modules, which can be integrated into post-election voter surveys. The fifth round of the CSES module will be integrated into the 2019 Selects questionnaire, and Selects also participated in the four previous rounds. Selects is also part of the well-established network Comparative Candidates Survey (CCS), which conducts surveys among all candidates for national elections in participating countries. Switzerland has conducted this additional survey in every election year since 2007. Editing and revising of scientific reports. The Selects Commission guarantees strong links of Selects with the Swiss research community and authorities involved in elections. The commission is mandated by the FORS Foundation Board. According to its mandate, the mission of the Commission is to guarantee the quality of electoral research in Switzerland and to strengthen the electoral research network at Swiss universities and with the authorities involved in elections. Selects is considered a research project of national importance. Therefore, since 2011, a sample of individuals representing the country’s population with the right to vote aged 18 and above has been drawn randomly from the sampling register of the Swiss Federal Statistical Office, in accordance with the Ordinance on the Execution of Federal Statistical Surveys (Art. 13c, para. 2, lett. d). For the post-electoral survey, the sample is stratified by canton, i.e. people are not randomly drawn across the whole of Switzerland, but randomly drawn in each of the 26 cantons. For small cantons, an oversampling is carried out in order to guarantee at least 80 respondents per canton, covering both voters and non-voters. In addition, in three cantons (Zurich, Geneva and Ticino), the samples were increased to 800 – 1,000 respondents. For the panel survey, the sample is drawn randomly across Switzerland to form a national sample of around 8,000 people. The survey includes three waves during which the same people are invited to participate each time. Two waves are conducted before and another one after the federal elections in October. In order to study the stability and change of individual opinions, as well as the behaviour between elections, it is planned to continue the panel every year until the 2023 federal elections. For the candidates’ survey, the population is defined and not random, since it includes all the candidates who stood for the election to the National Council and the Council of States. This survey is conducted after each federal election, regardless of whether the candidates were elected or not. The net sample of this survey includes around 5,000 respondents. The net sample of the panel survey includes approximately 5,000 respondents. During the election year, data is collected on the associated election campaign content in the media. The census includes the full population of candidates running for election. The data collection is conducted during the election campaign, gathering data from the candidates’ and parties’ public Facebook and Twitter accounts. Every four years, in addition to the core questionnaire, Selects incorporates new thematic modules that are of particular interest to researchers, while maintaining the necessary continuity to enable comparisons with previous waves. In addition, it should be noted that the various surveys are coordinated with each other. For example, questions related to attitudes towards certain political subjects are identical in the candidate survey and in the post-electoral survey, which makes it possible to compare the positions of candidates and citizens. Who participates in elections and why? Who votes for a certain party or candidate and why? In addition, every four years, FORS offers researchers the possibility to add thematic modules to the questionnaire that are selected based on a peer review process (call for modules 2019). 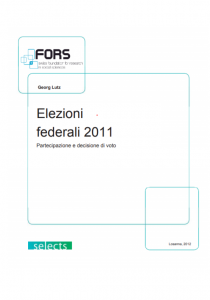 The submitted proposals are reviewed by the Selects Commission and subsequently compiled and adapted by the FORS Political Surveys team. “Attitudes towards immigrants and party choice in Switzerland”,studies the interplay between mobilisation of immigration issues by right-wing populists, attitudes towards immigrants and voting choices. What is the citizens’ view on political parties and how does this view evolve during the election campaign? This question aims at investigating the influence of campaign dynamics and postal voting on voting behaviour and on the opinion formation processes, as well as the importance of strategic considerations on voting choice as opposed to emotional campaign involvement. Alongside the panel survey, the objective of the media analysis is to put individual opinion formation processes into their information context. To what extent do candidates conduct their own campaign and distinguish themselves from their party? This question aims at studying the topic of individualisation during an election campaign. Among other things, the information gathered makes it possible to study the underlying factors of candidates’ electoral success, as well as issues such as representation and the links between voters and elites. To enable this, the study examines the use and impact of campaign tools in federal elections, attitudes towards democracy and the political careers of candidates. 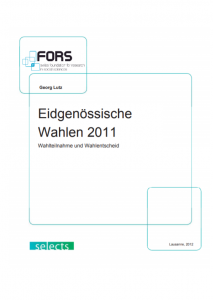 Every four years FORS offers researchers the possibility to add thematic modules to the questionnaire, which are selected based on a peer review process (call for modules 2019). The submitted proposals are reviewed by the Selects Commission and subsequently compiled and adapted by the FORS Political Surveys team. 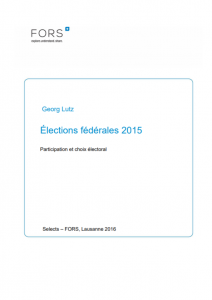 Questionnaires, codebooks, technical reports and the data of the Swiss Election Study (Selects) are deposited at the Swiss Centre of Expertise in the Social Sciences FORS and can be downloaded free of charge from FORSbase. 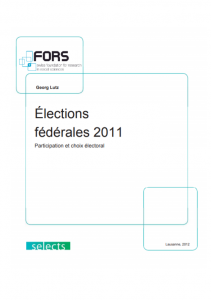 The Swiss data that is provided to the Comparative Study of Electoral Systems (CSES) is available via the CSES webpage. 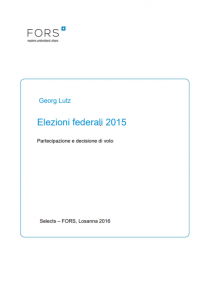 The 2015 Swiss National Elections. Nathalie Giger, Line Rennwald and Anke Tresch (eds.) 2018. Swiss Political Science Review 24(4). The (in)stability of voters’ perceptions of competence and associative issue ownership: The role of media coverage. Anke Tresch and Alexandra Feddersen (2018). Political Communication. The 2011 Swiss Elections. 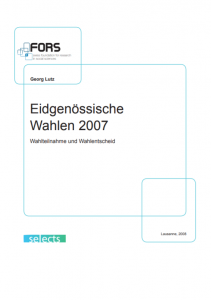 Romain Lachat, Georg Lutz and Isabelle Stadelmann-Steffen (eds.). 2014. 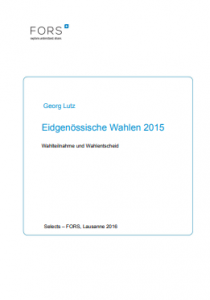 Swiss Political Science Review 20(4). The Swiss National Elections 2007. Georg Lutz, Thomas Milic and Marco Steenbergen (eds.). 2010. Swiss Political Science Review 16(3).